Well, as I said just a short while ago on my Face Book page (Keith Salmon – Scottish Landscape Artist) this morning Nita saw the first snow of this winter over on the mountains on the Isle of Arran. When I was walking over in Glen Rosa in January and again in March, I started to develop an idea to create a large (4.5 x 1.5 m) drawing based on the idea of walking through the glen in winter. Over the intervening months I’ve developed the idea and recently put a proposal to the Harbour Arts Centre in Irvine ….the idea is to use their large main gallery wall to create this new drawing. They’ve agreed to let me use the gallery next November / December (2014) to do the work and while I create the piece I’ll also hold an exhibition of my usual smaller paintings. Anyway, I’ll write more about that nearer the time. 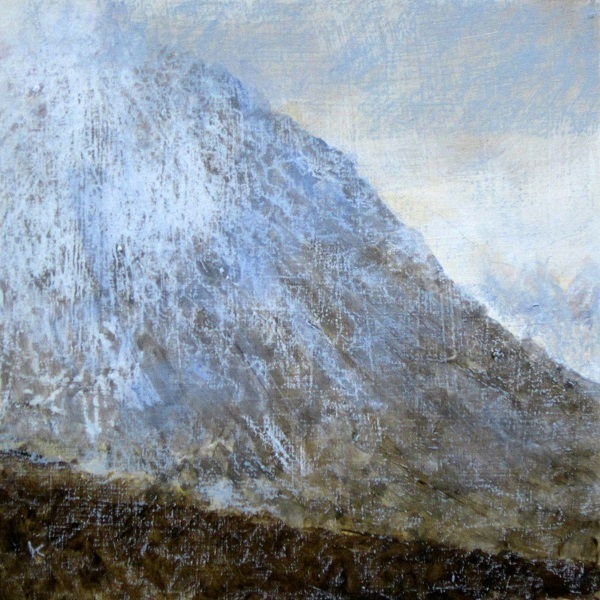 This little painting is one that I did following our walks in Glen Rosa earlier this year. With the new snow once again starting to fall on the mountains around the glen, I’m going to be going back there soon to start honing my idea for the big drawing, spending time looking, planning, sketching and taking photos. It should be a fun time and I’m really looking forward to the project …this time next year it should be well under way!